There is confusion in the climbing community about what are antagonist muscles and how to effectively train them to prevent injury. This article takes a deeper look at how muscles function when we climb and the importance of training antagonist muscles in a similar manner to how they contract while climbing. The term antagonist muscle has created a stir in the climbing world but few have fully defined and understood its meaning. Before learning what an antagonist muscle is, it is important to review the three common types of muscle contraction. Concentric: The muscle shortens to create movement. Example: Curling a weight into a biceps curl. Eccentric: The muscle lengthens to control movement. Example: Slowly letting down a weight from a biceps curl. Isometric: The muscle sustains a fixed position to stabilize movement. Example: Holding a weight in the mid range of a biceps curl. An antagonist muscle is a muscle that opposes another muscles action. If you use the example of a biceps curl, the biceps contracts and undergoes a concentric muscle action. The triceps on the opposite side of the arm lengthens and relaxes to allow the elbow to bend. Under high stress, such as during climbing, the antagonist can undergo an eccentric muscle action to control movement at the end ranges of motion. In this example, the biceps muscle is the agonist and the triceps muscle is the antagonist. The triceps antagonizes or opposes the movement of the curl. So aren’t all of our muscles antagonists during varied movements of climbing? The answer is yes. When we climb, we use every muscle in our body. When we pull our body close to the wall to perform an undercling, we are using our biceps as an agonist and our triceps as an antagonist; just as in the bicep curl example above. But when you perform a mantle, the roles reverse. Your triceps muscle becomes the agonist and the biceps becomes the antagonist. If all of our muscles act as antagonists to movement, then should an antagonist muscle strength program target every muscle in the body? Not necessary. 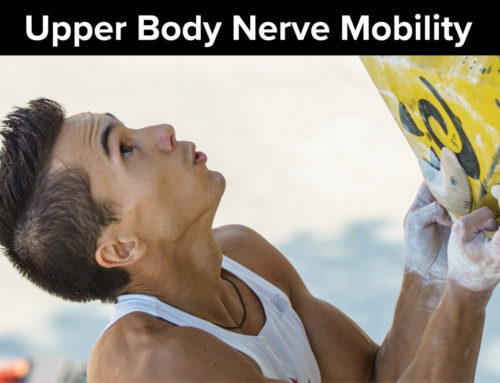 In climbing, there are certain muscle actions that we use repeatedly. Think about how often you pull with bent arms versus the number of times you mantle in a given climbing session. Chances are that you pull with your biceps more than you push with your triceps. So the less commonly used triceps muscle is generally considered to be an antagonist muscle for climbing. But there are always exceptions. For example, if you are projecting a problem called “mantle mania” that has 12 simultaneous mantels, then your triceps become more of a primary muscle. Injury prevention programs that target antagonist muscles provide only suggestions of which muscles are less commonly used as primary movers while climbing. You must identify which climbing techniques or movement patterns you overuse and perform antagonist strength exercises to specifically counteract them. Can you identify the poor climbing movement patterns below? An example of climbing inefficiently with bent elbows. This increases the stress on the biceps. An antagonist program would focus on the triceps muscles. Climbing with elbows in a chicken wing. This puts excessive stress on the shoulder joint and is a result of the lats and shoulder internal rotators working too hard. An antagonist program would focus on the external rotator cuff muscles. too much wrist flexion. This is a result of the wrist flexor muscles working too hard and can compress the joint and nerve in the wrist as well as lead to inside elbow pain. An antagonist program would focus on the wrist extensor muscles. I understand now. An antagonist prevention program focuses on the muscles that are not the primary ones used for climbing. These antagonist muscles are typically the same for most climbers but may vary based on climbing technique and choice of routes. Yes, but it gets more complex. There are some antagonist muscles that instead of lengthening and relaxing to control movement as in the biceps/triceps example, they contract isometrically to stabilize movement. So although they are still considered antagonist muscles, they function much differently than the other antagonist muscles in the body. A great example are the shoulder blade muscles. Evidence is beginning to emerge that show the direct relationship between stable shoulder blades and elbow pain. A study was published in the Journal of Orthopaedic & Sports Physical Therapy in 2013. The study was titled Middle and Lower Trapezius Strengthening for the Management of Lateral Epicondylalgia. Although it was a single person study, it was the first of its kind to begin to link shoulder blade stability to improved elbow pain. A key finding in the study was that grip pain was significantly reduced when the shoulder blade was positioned isometrically closer to the midline of the spine. Simply put, grip pain decreased when the shoulder blade was positioned down and back. I want some anecdotal evidence as well. I test this theory all the time with my private clients in clinic. I give them a dynamometer, which is a tool that measures grip and have them squeeze as hard as possible. I then instruct them perform an exercise isometrically that will engage the shoulder blades such as a “Bent over letter T” with a resistance band (photo at the bottom of the article). They hold the isometric shoulder position for 60 seconds. After the exercise, I retest grip strength. Almost every time it improves. Why? Their shoulder blade muscles didn’t get stronger in just a few minutes. How do you explain the increased grip strength? It is possible that the isometric contraction of the shoulder blades “wakes up” or “activates” the muscles. Isometric activity, because of its longer duration, allows time to develop a brain-body connection. The shoulder blade muscles don’t get stronger, just more activated. This increased recruitment of the shoulder blade muscles can provide a stronger foundation for gripping. So you are saying that some antagonist muscles relax or lengthen eccentrically, like the triceps and some stabilize isometrically like the shoulder blade muscles. Does this mean I should train them differently? Based on how a muscle is used while climbing should determine how it is trained. You should train the triceps muscles with eccentric exercise. This is how the muscle is typically used when climbing at the end ranges and under high load. However, you should begin to think about training your shoulder blades with isometric exercises to perform a stable base for your moving arms. Understanding muscle function during climbing and mirroring the muscle actions during training will make your exercises more effective. However, it is important to know that antagonist strengthening alone won’t prevent injury. You need to be mindful of your climbing technique and patterns. Identify any dangerous movements that are leading to overuse syndromes and remember to always listen to your body. This will allow you to climb even harder and injury free. This exercise is used to build antagonist muscle strength isometrically. Exercise is ideally performed for a duration that matches the length of time on your route. This exercise is used to build antagonist muscle strength eccentrically. Exercise is ideally performed for a number of repetitions that matches the length of time on your route.